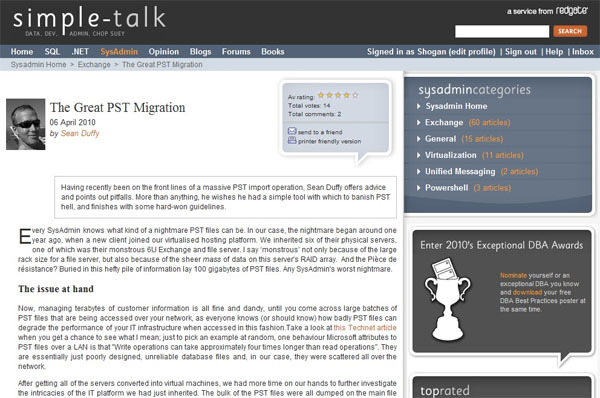 A short while ago I wrote an article for the SysAdmin section on Simple-Talk.com. The article covers a bad experience I had importing PST files into Exchange mailboxes specifically to get them archived by some specialist archiving software. A short while afterwards I was introduced to Red Gate’s PST Importer (via an early access program). After trying out the PST importer I was happy to report that the headaches involved with doing PST imports had basically been solved by this excellent bit of Software. So if you are interested in reading the article, please hop on over to Simple-Talk.com and have a read!